We will be doing some server maintenance on Monday, July 25th to update to the newest version of Ubuntu. I apologize for any lack of work units during this time. Message 64935 - Posted: 25 Jul 2016, 3:04:44 UTC - in response to Message 64928. How long the Milkyway server will not be reachable? So I guess the BOINC server software will remain 'old'? I have inter alia four AMD Radeon R9 Fury X VGA cards and it's still not possible to get work, if the project is 'stock'. I need to use (the following entries and apps are correct?) an app_info.xml file. BTW. Is the milkyway_separation__modified_fit part superfluous now, so I could delete this part in red (and this two apps)? 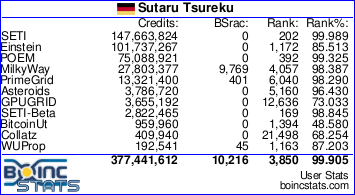 I updated the BOINC libraries on the server about 3 weeks ago. I am not sure why it still doesn't recognize certain GPUs. That's on my to do list for this Summer, but it is not a problem I have solved yet. As for the app_info.xml files, I am unsure what they are used for actually. On every computer I have set BOINC up on, it has just worked out of the box. There are some much more knowledgeable users over in the number crunching section who can help with the app_info.xml if you need help. Ubuntu is the operating system we use on the server; it is a flavor of Linux. It is nothing you really need to worry about. The server might just be down for a couple hours today. Message 64940 - Posted: 26 Jul 2016, 9:16:05 UTC - in response to Message 64937. Message 64944 - Posted: 27 Jul 2016, 0:45:45 UTC - in response to Message 64937. Maybe one day an Intel iGPU OpenCL Milkyway app will be released? NVIDIA and ATI/AMD OpenCL apps are available - it would be a big deal to 'translate' it to Intel iGPU? I have an Intel HD Graphics (no number ;-) iGPU in my J1900 CPU. I read a lot in the forum and found that the GPU apps can be tuned. I don't know if this are the 'strongest/fastest' possible settings - and maybe it could be counterproductively...? Is somewhere an overview with explanation of all possible cmdline settings - and how to set them? If not, it's possible to do this (maybe sticky thread in Number Crunching)? Last I checked, double precision was not well supported on Intel HD Graphics devices. However, with Haswell, it looks like they are phasing in better double precision support and it is something we should look into. We probably won't have time until we are better caught up on some of the other projects we are working on, but I doubt there will be much progress until late in the Fall. Does anybody know what's going on? I have no uploads no downloads and the server status page is all garbled up. The whole project on my end has been down since yesterday on all of my computers. It was just planned server maintenance that took longer than expected. I posted I would be doing some upgrades last week, but I couldn't start them until yesterday. Everything should be working now. Message 64987 - Posted: 5 Aug 2016, 11:15:03 UTC - in response to Message 64985. Message 64988 - Posted: 5 Aug 2016, 11:16:04 UTC - in response to Message 64985. Sorry about that Jake.....everything is coming back online. No need to apologize. Probably looked pretty scary from your end, so I understand.